BETHLEHEM (Ma’an) — The Palestinian Red Crescent treated 339 protesters on Friday at protests around the West Bank to mark Land Day, a spokesman said. 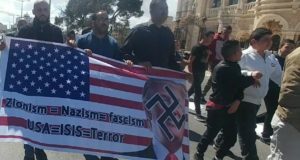 Muhammad Ayyad told Ma’an that five people were seriously injured and 55 hospitalized as protesters commemorated six Palestinians who were killed by Israeli forces in 1976 at demonstrations against Israel’s land confiscation in the Galilee. Three people in Bethlehem were critically injured, one of whom was hit in the face by a tear gas canister. 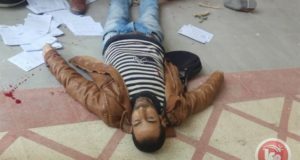 A protester in Jerusalem was hit in the jaw by a rubber bullet and in Kafr Qaddum, near Qalqiliya, a protester was hit in the pelvis by a tear gas grenade, Ayyad said. 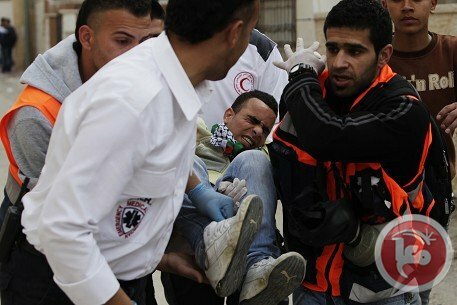 The largest rally took place in Qalandiya, a checkpoint near Ramallah, where 249 were treated for injuries and 20 hospitalized. Ayyad said Israeli forces injured nine medics and damaged three ambulances at the protest. An Israeli military spokesman said forces fired rubber bullets, tear gas and foul-smelling chemical water at protesters who were throwing rocks. Similar confrontations broke out at a checkpoint in Bethlehem, where Ayyad said medics treated 38 people including 11 who were hospitalized. In Jerusalem, medics treated 35 people, 19 of whom were transferred to hospital. 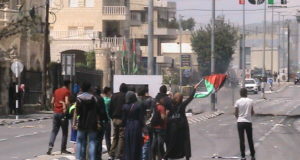 Four people were hospitalized in Iraq Burin, near Nablus and 13 were injured in Kafr Qaddum at simultaneous protests.